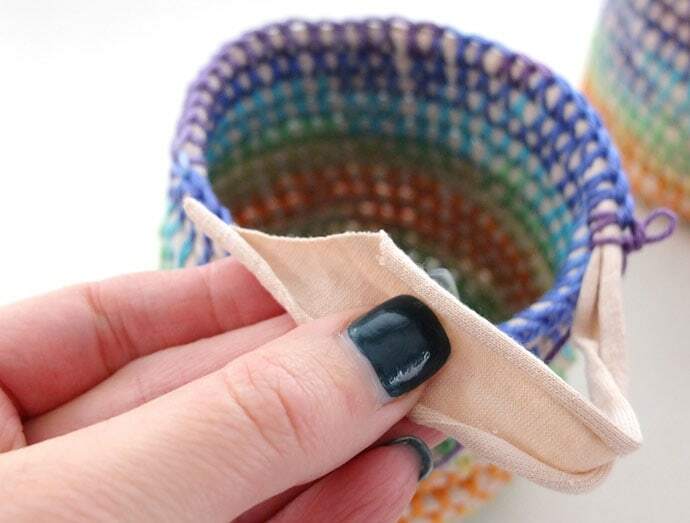 Little baskets are so handy for corralling small miscellanea that seem to end up all over the house, you can never have too many. 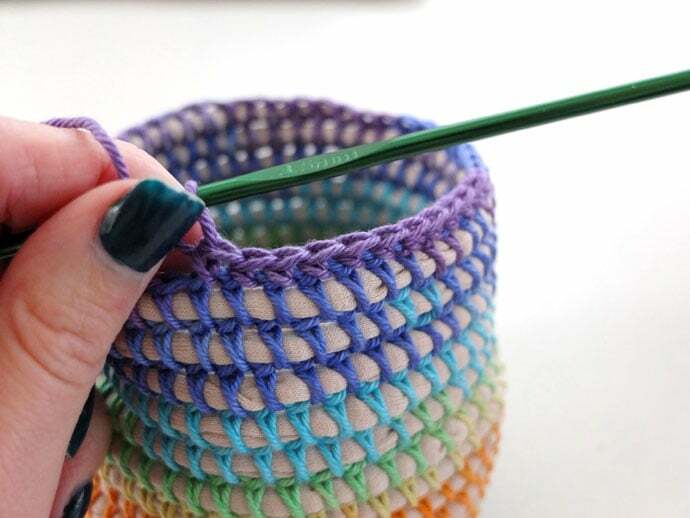 I’ve created some lovely rainbow hued ones with a simple coil basket making technique, but instead of weaving I’ve used crochet which makes the process go a lot faster. 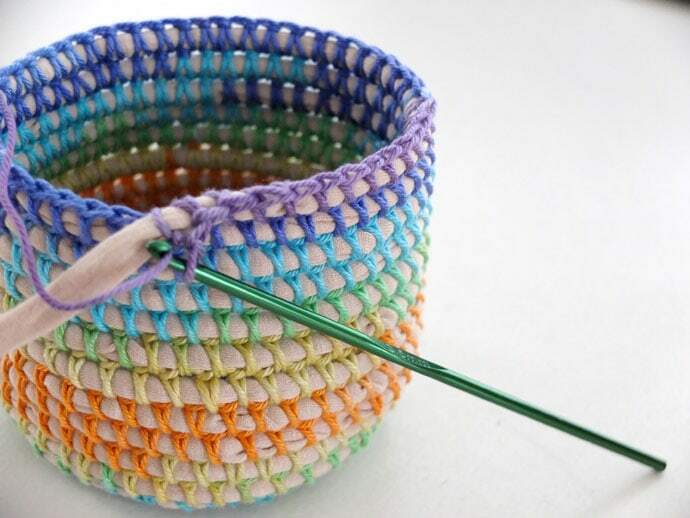 There baskets were actually an experiment in using variegated gradient yarn. I received a few samples of 4ply cotton from my friends at Spotlight and loved the way it looked on the ball. I love the idea of variegated yarn but am often dissatisfied with how it pools when knitted or crocheted, so it was time to experiment. 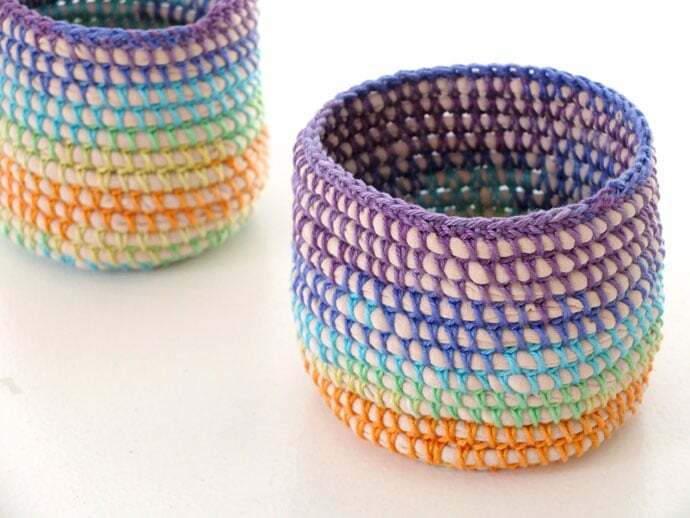 These Crochet Coil Baskets show of the rainbow gradient perfectly, I’ve sized them to make the best use of the yarn’s pattern but if you have yarn with a less prominent gradient/variegation, you can adjust the size of your basket accordingly. 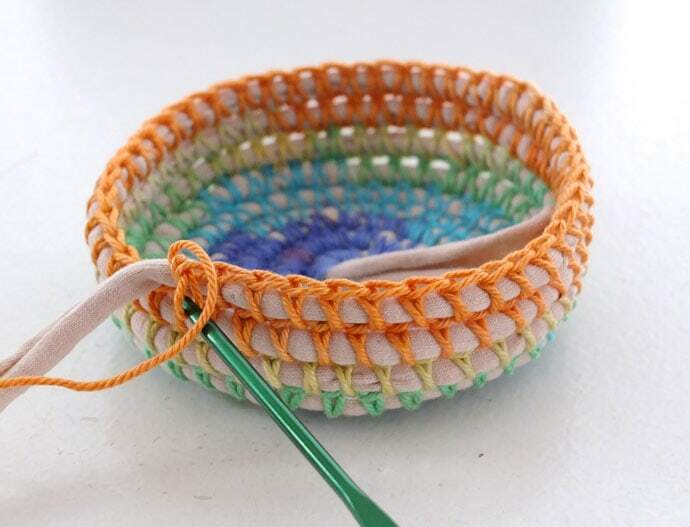 Because I’ve used t-shirt yarn as the core, they are nice and floppy but if you want a firmer basket consider using thin rope. You can even make them fit around an old jar and hey presto, a new vase! Gradient rainbow yarn cotton yarn – I’ve used 4ply Mornington Yarn from Spotlight which I received in a goodie bag a few weeks ago. 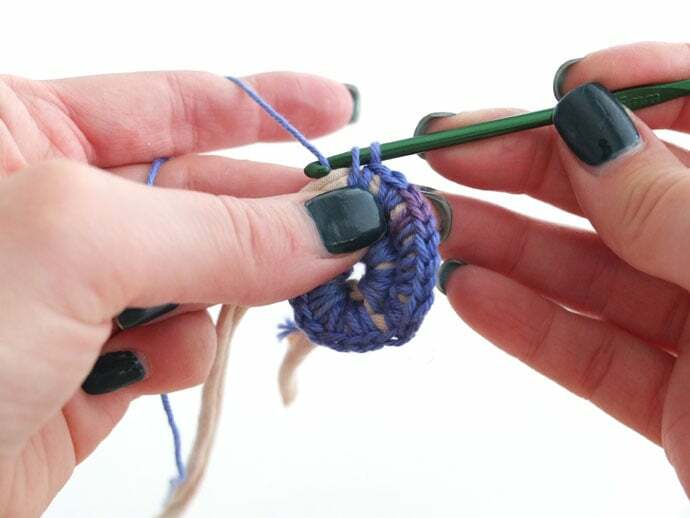 Single crochet over a cord is much the same as tapestry crochet, the idea is to form your stitch around the cord and encase it. The stitch mechanics remain the same. I’ve taken some step by step photos and made an animation to help you if you are not familiar with the single crochet stitch. Insert hook through top of stitch in previous row. You should now have 2 loops on your hook. 1. 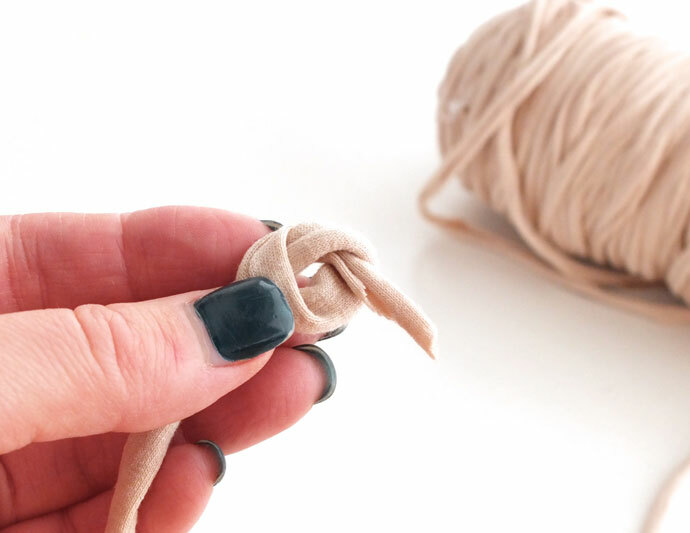 Wrap the t-shirt yarn (or cord) into a small ring. 2. Sc closely together as many stitches as you can fit around the ring. If you have a small tail hanging out that’s ok.
3. Sc all the way around until you are back at the start (that was round 1). 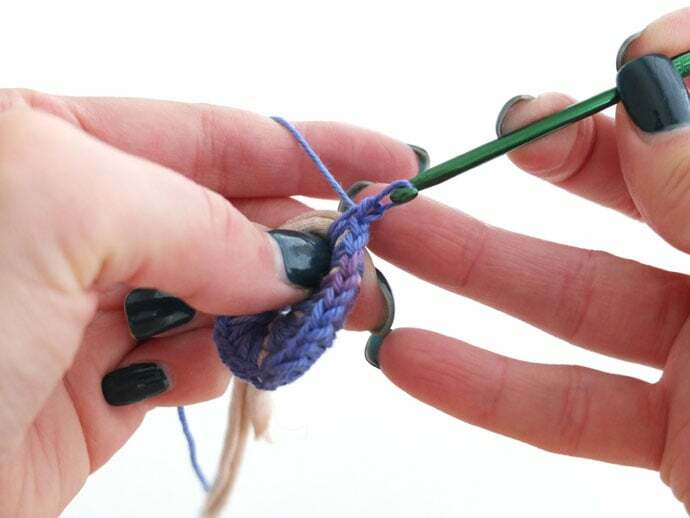 You will now work in a spiral with the hook going into the corresponding stitch below (from previous rounds). For round 2, Sc 2 stitches into every stitch from the round before. 4. 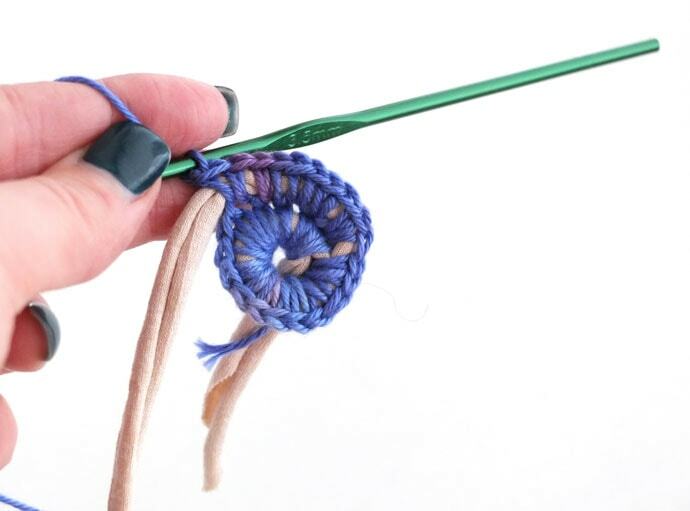 Carry on in a spiral with and occasional increase (2 stitches in one), checking that the work lies flat after every round. If it starts to cup, you need to add more increases. There is no strict formula for this as the tops of the stitches elongate over the cord allowing for it to sit flat. Crochet to the desired base size, mine was 9cm. 5. When it’s time to build up the sides, re-position the cord so it sits up (as opposed to flat), continue Sc with no increases. 6. You should notice the edges start to curve up once the first round of the sides is finished. 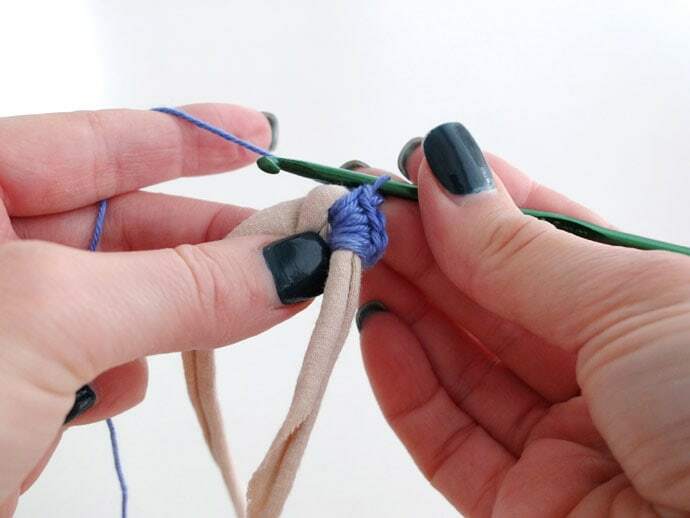 If it’s sill sitting flat give the cord a gentle pull to gather the stitches in. 7. 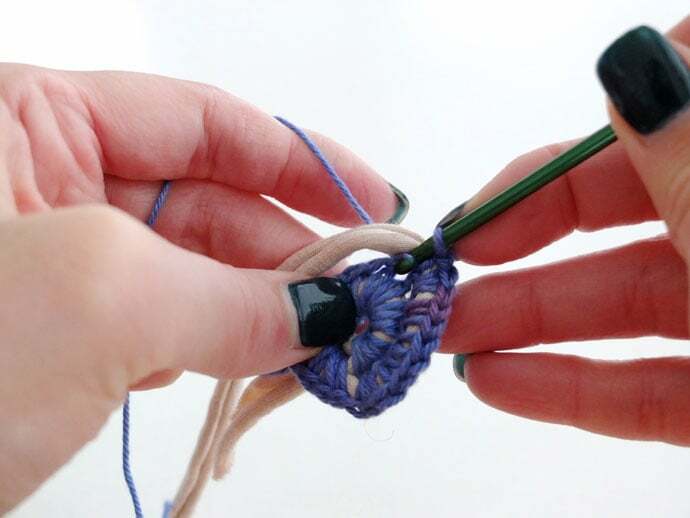 Flip your work over so the right side will now face out as you continue to crochet. 9. 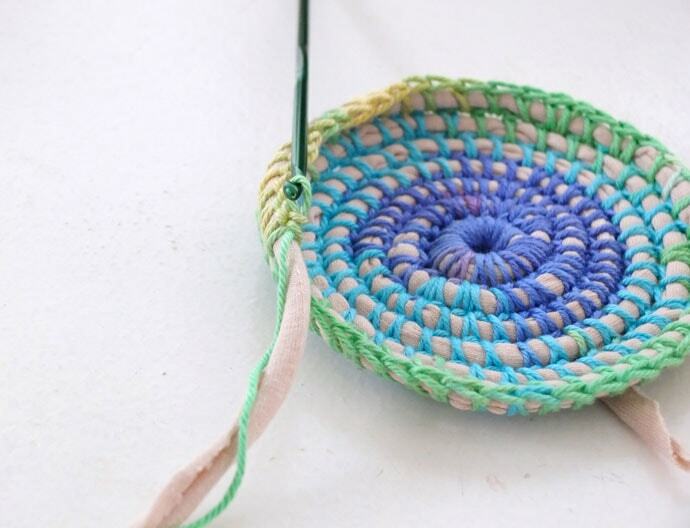 When you are happy with the basket height (mine was 9cm) taper your t-shirt yarn or cord. 10. Sc until the end of the cord is fully covered, it should taper off gradually. 11. To finish off, crochet a final row of Sc then break off yarn and weave in ends. All done! Don’t they look smashing? I love how the colour gradually changes up the sides of the basket. They are the perfect size for storing all sorts of little bits and pieces in. Use them to store craft supplies, stationery, jewellery, makeup, toiletries, small toys…the list is endless. They would also make a great gift for a friend filled with treats, like a mini hamper. 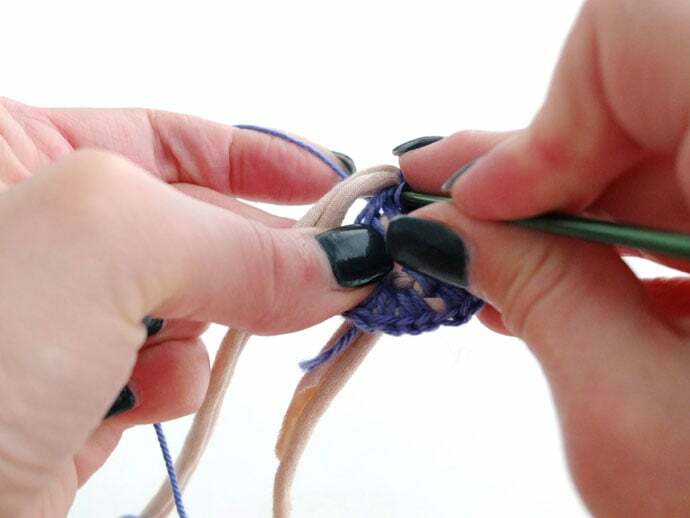 Now you know how to crochet over a cord, you can adapt the same techniques to a bigger project. 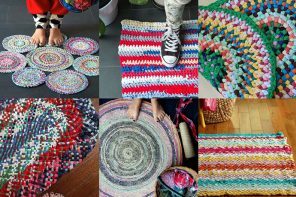 I’m making a rug and I’ll share it here very soon. 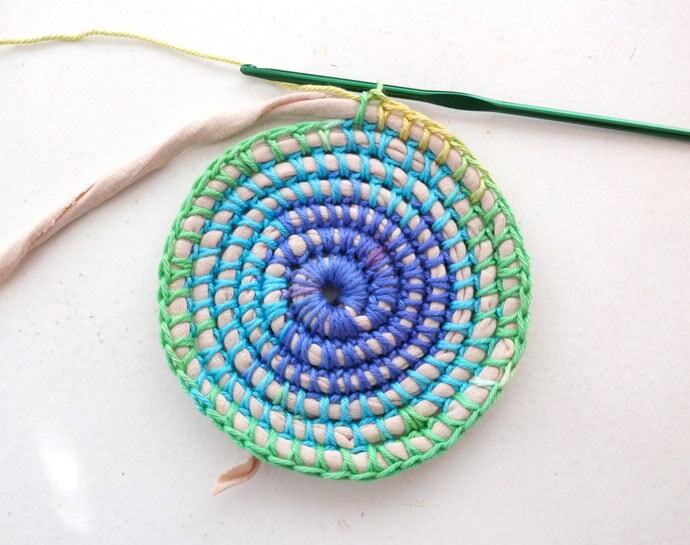 What a beautiful project and such awesome instructions – love it! OOH! big craft room, that’s exciting! Thanks so much Lisa, you always leave the nicest comments. I really appreciate it. I’d love to hear how your basket turns out. My first attempts at things aren’t always perfect. These look amazing Cintia! Would make fabulous presents. Love these! 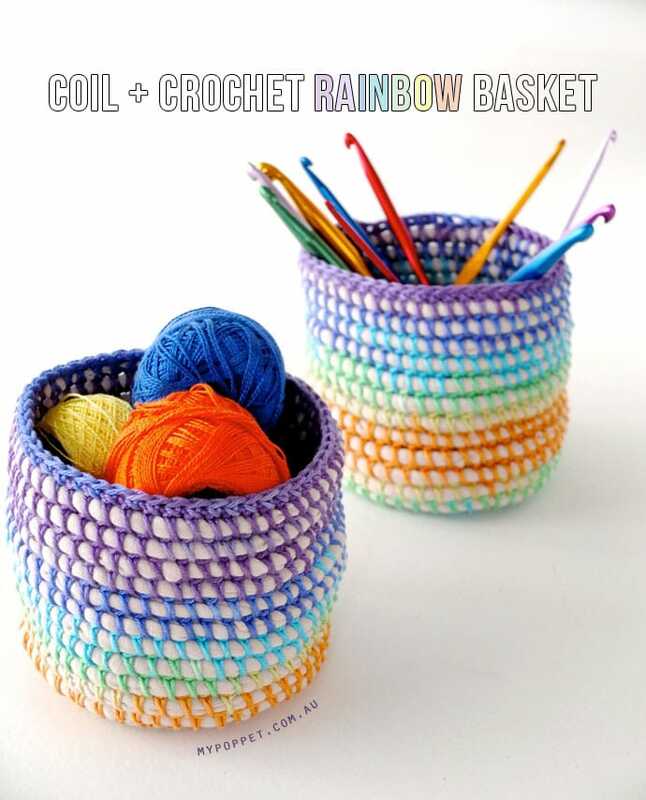 The baskets are so cute and I’m a sucker for rainbow anything – plus the step-by-step tutorial is so easy to follow. Love! Thanks Tonya, glad you like them. 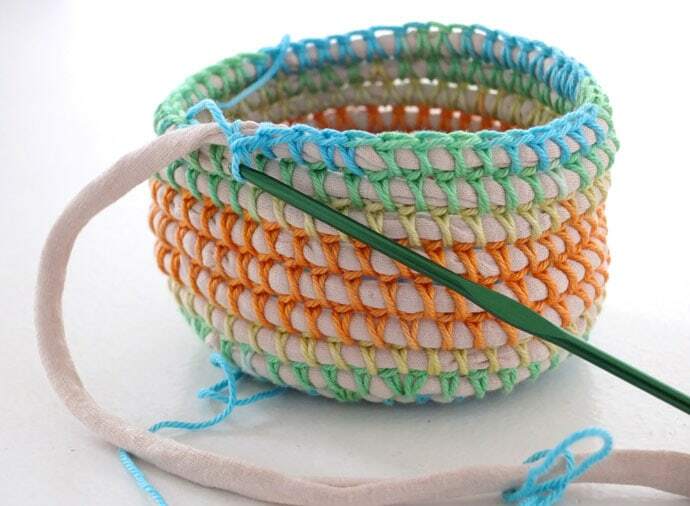 This is fabulous Cintia, I’ve been wanting to make some coil baskets, and crocheting them is certainly a great way to go! I’m going to try it with some homemade yarn from sheets possibly, I”ll let you know! Great, thanks for letting me know. I must have gotten an early preview. 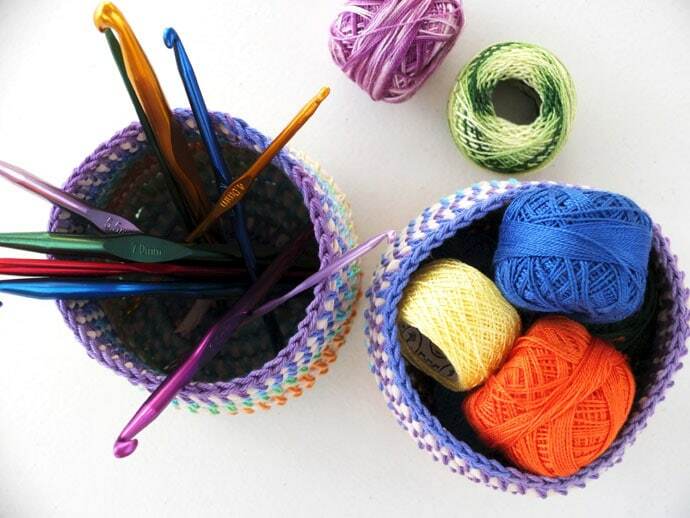 Love the baskets and want to try them but can’t find the yarn. Their yarn stock is quite seasonal so they may have sold out their supply. I’ll have a poke around the online store and see if it’s still available. Otherwise any other gradient style yarn will give similar results. 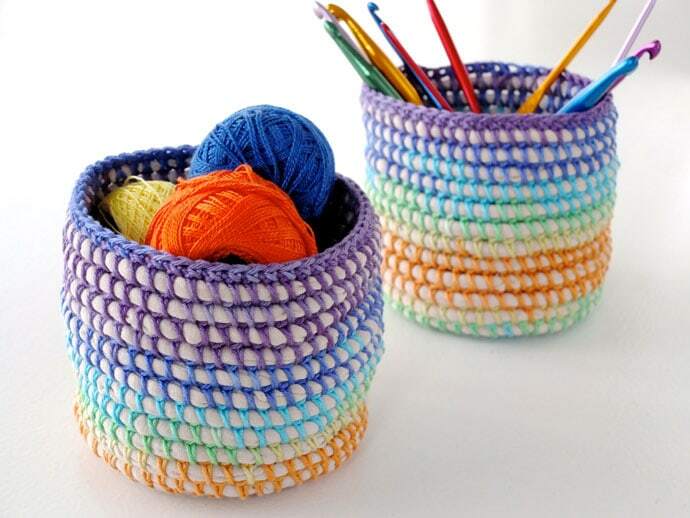 I wonder if you could make spool knitting or i-cord with the Spotlight multi-color cotton that you’ve used for these little baskets, then use that cord as the base for another set of baskets with white size 10 crochet cotton as the material to crochet the basket together. I wonder if you’d get the opposite color effect in a way that would look good paired with the bowls you have made up here? If the i-cord wasn’t sufficiently stiff, a person could run a length of drapery pull cord or something of that sort through it, I suppose, possibly even as you work up the i-cord or spool knit. I really like the ones you’ve shown here. I’m seriously tempted to start a project like it! I think that would work great but you are right in saying that the icord would be too soft to hold a shape. Running a small cord/rope through it would make it ideal. I’d love to see the result if you do give it a try. Thanks for your comment and idea, I may give it a try too. 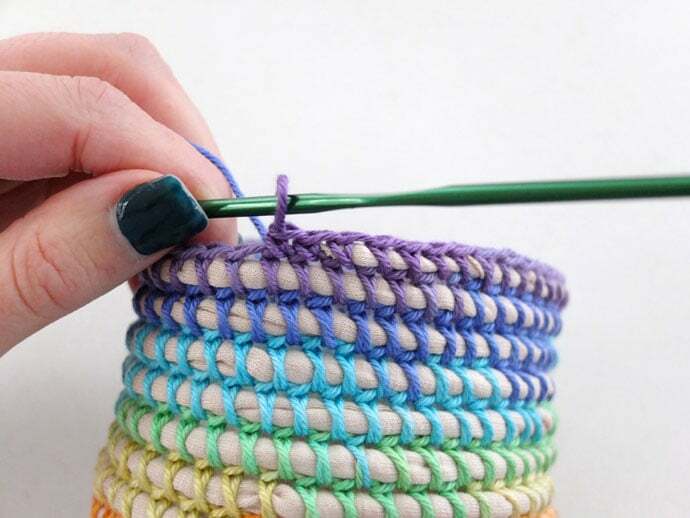 Could you possibly adapt the crochet stitch for us “lefties”? Great tutorial! This is great! 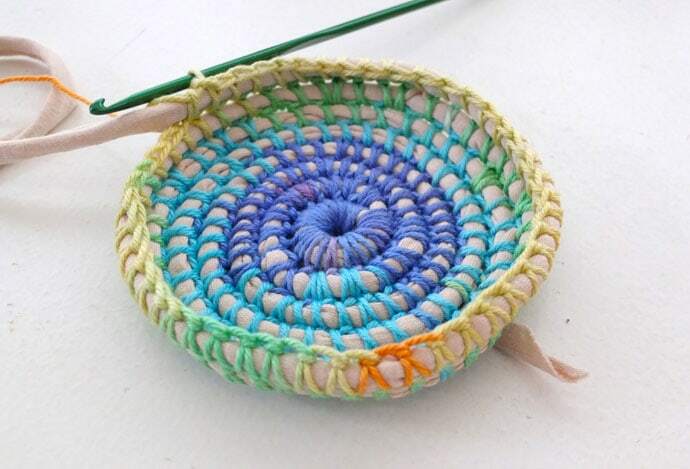 I love the look of coil baskets and your tutorial makes it look really easy. 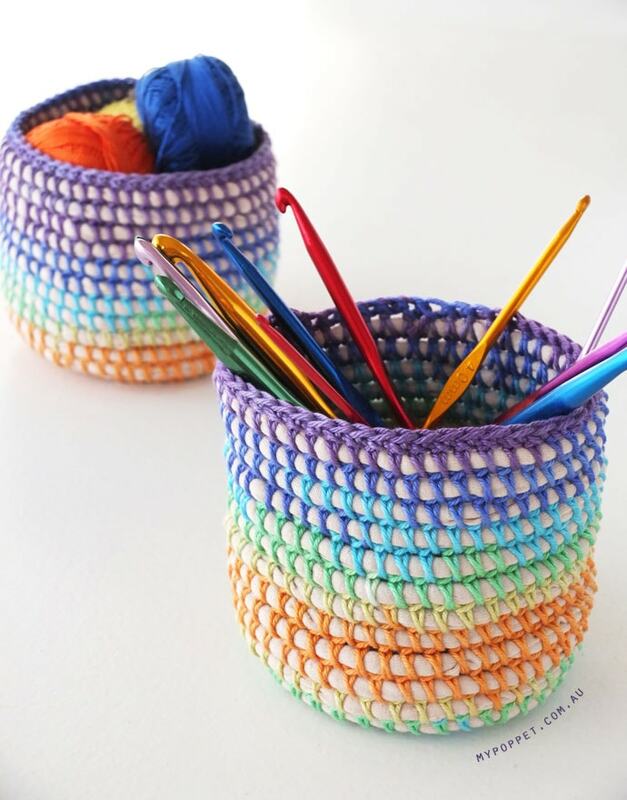 Love the use of the rainbow yarn! Thanks for sharing this. Spotlight (Auckland, NZ) do not stock T-shirt yarn and I haven’t been able to find anyone else here that sells it. I am very keen to make the small baskets. You have suggested ‘cord’ as an alternative. What sort of cord is that – is it upholstery cord? you can cut your own t-shirt yarn (refer to my latest post) or thick piping cord will work too. Check out your local hardware store for thin cotton rope. Thank you Cinita. I will try your alternative suggestions. I will be in Brisbane later this year so if all else fails here then I may be able to get it there. 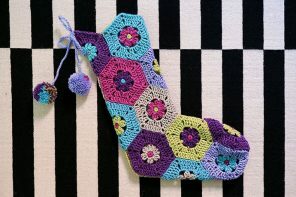 I would love to know what yarn you used for the single crochet part. It’s gorgeous, and I can’t find anything like it locally (USA, Oregon). I’m thinking about cutting up a sheet and using that as my core, what do you think? hoping to create some hanging baskets for the kids’ toys. Thanks for the beautiful DIY craft! I a currently making a basket myself. I am new to crocheting but the basket is going great so far. I struggled a little bit with the start, since I couldn’t use the step by step tutorial for the first spiral, but I made due. My question is, did you add any increases up the walls? Mine seems to want to cave in a little as I move upwards. Hi Megan, the walls have no increases. I suspect what may be happening is that because t-shirt yarn can be stretchy (some types more stretchy than others), as you are crocheting it you are pulling it. When it relaxes it is pulling in like elastic. To reduce this happening you may need to adjust your tension a little looser so your yarn isn’t under tension as you crochet. I hope that helps. I am going to learn to crochet so i can make one (or two) of these. Hello! 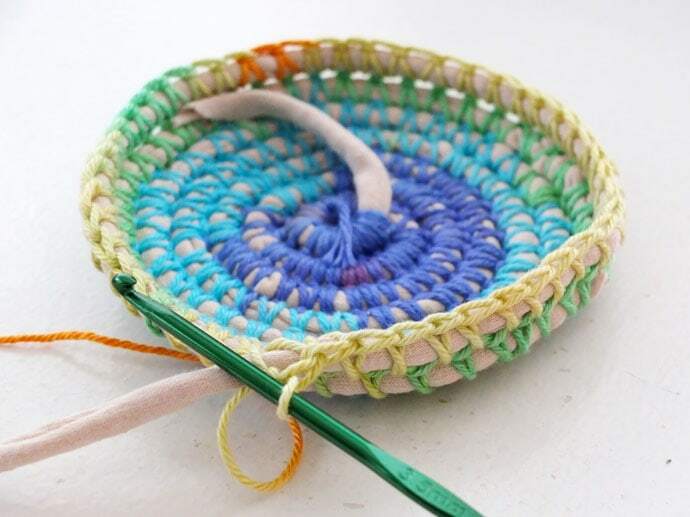 Please please tell me you know how to “taper off” a basket using plastic tubing and in the spiral! I have a great basket, T-shirt yarn over tuning, but at the top there seems to be NO way to end it off without a huge hump. You could try cutting the tubing diagonally so it thins out at the end? There is no strict formula but you do need to increase a few sc in every round or the shape will start to cup up. In the 2nd round I’ve put 2sc in every stitch but in the 3rd I’ve only put 2sc in every 3-4 stitches. Yes you can. A few readers have asked a similar question so I will create a tutorial for it. If so, what do I have to write? Hi Emma, yes happy for you to sell the finished product in limited production if you are personally making them. If you are selling online please mention the original designer as My Poppet with a link to mypoppet.com.au. 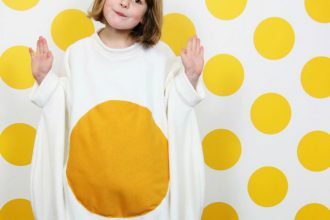 If you are selling at a craft fair or to a store, please mention ‘original design by mypoppet.com.au’ on any tag attached. Yell out if you have any further questions. I’ve been crocheting for 50+ years. I recently found your baskets on Pinterest and had to make some. I’m having trouble getting the internal cord to show through the stitching. The only way I’ve had any luck is to ch 1 and skip1 on previous round. Have tried 2 different cords and 2 different weights of yarn, and larger hook. Please advise what I am doing wrong. You aren’t doing anything wrong. 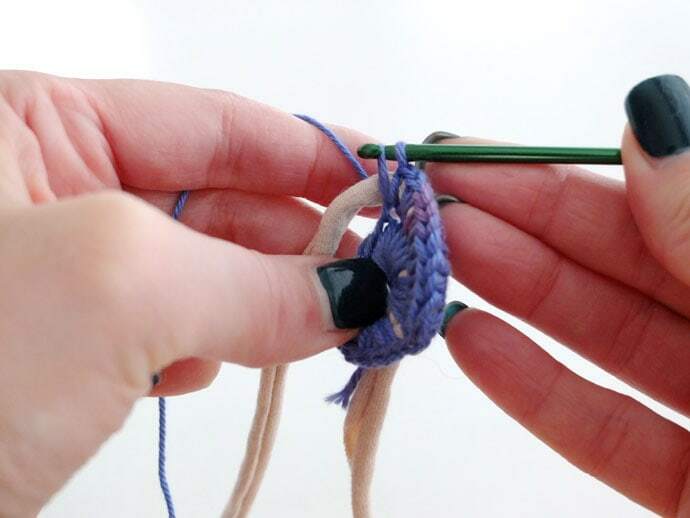 To space out the stitches without having to add an extra chain stitch, try elongating the top (last) loop of each stitch. That will space out the stitches.